Cascades’ senior management with Laval Cloutier, Eastern Canada Sales Manager of BASF, Chafiq Belouadi, Global Key Account Manager of BASF, Carles Navarro, President of BASF, Jim Hewitt, Chairman and Chief Executive Officer of Hewitt, Robert Lebel, Vice President and General Manager, Material Handling of Hewitt, Stéphane Guérin, President and Chief Operating Officer of Hewitt. 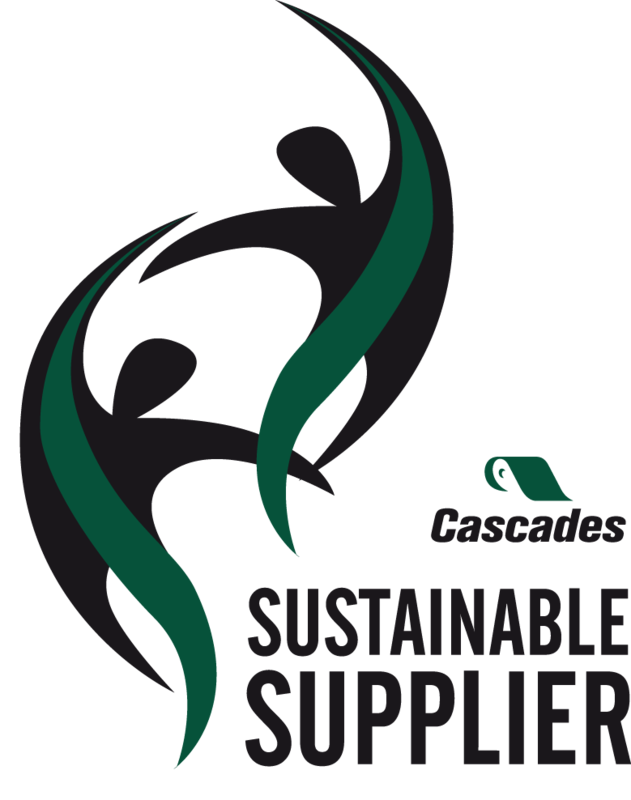 In fall 2014, Cascades launched the sixth edition of its Sustainable Supplier Award. The contest was created in 2009 by our Corporate Purchasing Department. Every year, the contest rewards suppliers whose projects have had a significant positive impact on Cascades’ sustainable development objectives. The initiatives may be carried out in different areas, as long as they lead to improvements in a product’s characteristics, processes or manufacturing methods. 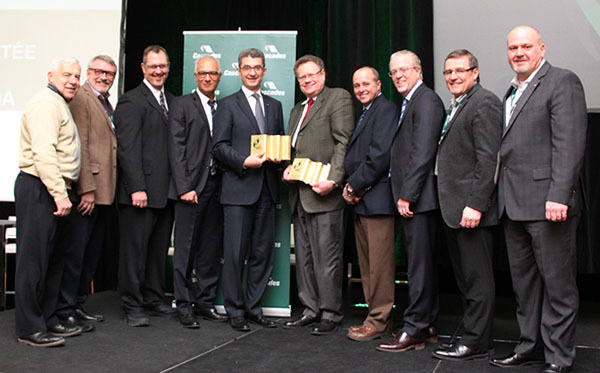 This year, our judges decided to honour two winners whose performance was deemed equal: Hewitt Equipment Ltd. and BASF Canada are the winners of the 2014 Sustainable Supplier Award! Hewitt is helping Cascades to optimize its fleet of forklifts by replacing the internal combustion engines (powered by propane and diesel) with electric forklifts. The project does a remarkable job of integrating the environmental, social and economic aspects of sustainable development. The new forklifts allow Cascades not only to reduce its ecological footprint through the use of clean energy, but also to ensure the health and safety of Cascaders. The fleet is equipped with advanced features that prevent risks in the workplace. The Hewitt project also led to gains in terms of time and productivity that translate into significant savings, in addition to a reduction in Cascades’ energy costs. In 2014, thanks to collaboration with BASF, Cascades was able to launch a highly innovative product. The supplier’s expertise contributed to the development of a water-based barrier as an alternative to polyethylene (PE), allowing Cascades to offer an eco-friendly food packaging solution that is compostable and entirely recyclable. In fact, the product earned a coveted Envirolys award in the Innovation and Environmental Protection category shortly after its launch. The new water-based barrier eliminates the cardboard conversion step, thus optimizing manufacturing logistics and generating cost savings. The suppliers received their awards on February 3, 2015, in front of Cascades’ senior management and all of the Company’s North American plant managers. It was a great opportunity to express our sincere thanks and to encourage responsible and sustainable initiatives!